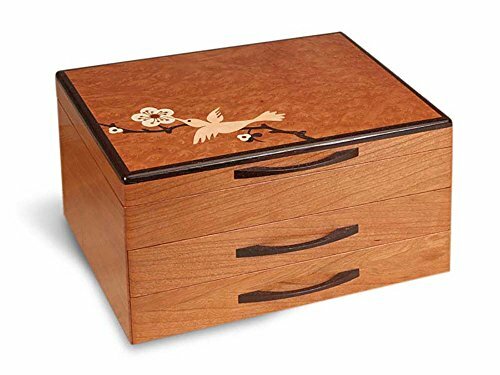 This beautiful Hummingbird Marquetry Jewelry Box is hand crafted out of Cherry Wood. Features precise execution to create the beautiful hummingbird with floral design on the top of each lid. Lid is made of Madrone Burl with marquetry accents of Maple, Wenge, Bloodwood, and Tiger Maple. Felt feet and drawer stops add special unseen touches. The box is designed with removable drawer and top inserts that can be removed to house your unique collection. This box measures 12 inches long x 9 inches tall x 6-1/2 inches wide. 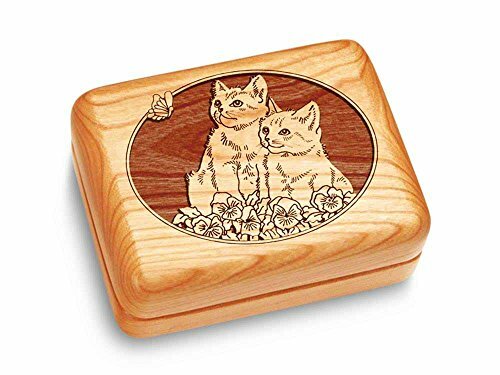 Every Musical Memento box is skillfully and precisely tooled to create a piece of woodcraft that will last for years to come. Fill it with little items like coins, thumbtacks, buttons, or larger items like bracelets, watches, and pins. Made of solid American Cherry and fitted with a soft black lining, this box will be sure to protects its contents. Measures three inches by four inches . This three drawer beauty is the epitome of the Prairie I Collection. Crafted from American Cherry with a Madrone Burl top, the single-piece construction technique and mitered corners add strength, durability, and continuity to the box. A soft pearl lining protects jewelry and removable drawer inserts and top dividers create unique space for your collection. Final touches include felt feet, drawer stops, and the artist's signature engraved into the bottom. This box measures 12 inches x 9 inches x 8 1/2 inches. 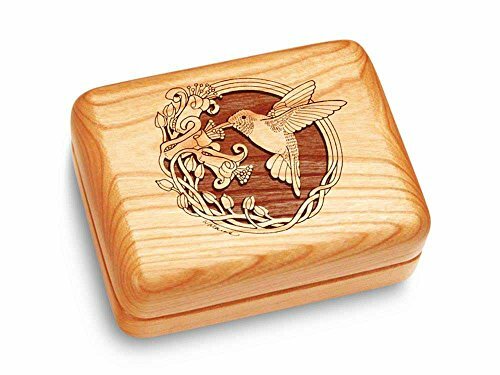 Precise laser engraving gives this Musical Memento box a stylish look and, made form solid American Cherry hardwood, it is sure to pass the test of time. Fill it with little items like coins, movie ticket stubs, thumbtacks, buttons, or larger items like bracelets, watches, and pins. Fitted with a soft black lining, this box will be sure to protects its contents. Measures three inches by four inches . 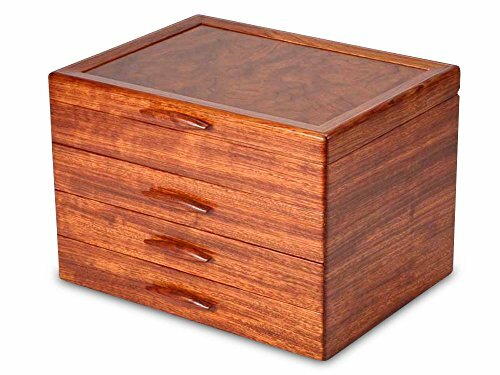 Modern Artisans Burl Walnut and Sapele Handcrafted Hardwood Valet Box, 10.5" x 7.25"
Handmade in the USA, the Chesapeake Valet Box is handcrafted with heirloom-quality hardwoods. 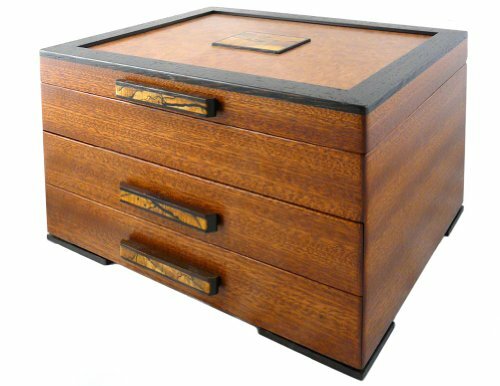 The box is constructed of a single specimen of sapele, assuring perfect color and matching wood grains, while hidden wooden key segments are added to each mitered corner to add strength and durability. The handsome lid is created from a burled form of American walnut, expertly cut to reveal the wood's swirling pattern, and framed in natural walnut. Within the valet, the bottom is lined with felt fabric for safe-keeping of personal items. A sliding (and removable) upper tray includes 2 lined compartments for easy access to keys or coins. Wood details : Each box is constructed of natural hand-polished sustainable hardwoods and provided with a premium clear finish to protect against scratches and moisture. All coloring is natural - stains are not used. Walnut is native to North America with dark brown grains that continue to enhance with age. 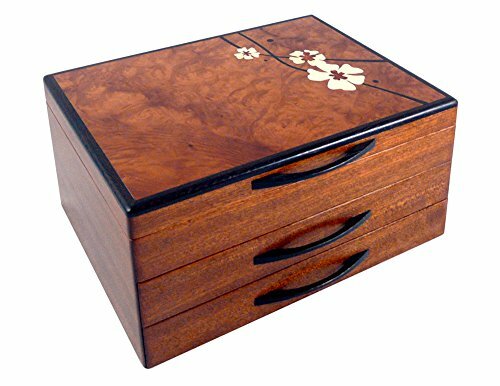 Sapele is native to Africa - It is very similar to mahogany with a lighter reddish-brown tint. Although more abundant than mahogany, sapele is selectively harvested to promote sustainable farming. Wenge is a non-endangered African hardwood with a dark, bold color and high strength. A gift that can be opened again and again! 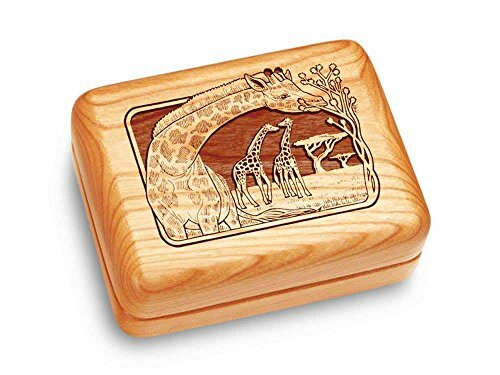 The 4.5" flip-top keepsake box is crafted using natural cherry and bubinga woods with a lid that flips open with the touch of your hand. 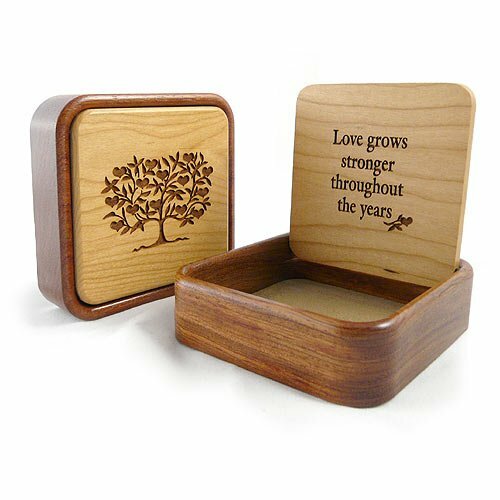 The exterior of the lid flaunts a laser-engraved contemporary design of a tree adorned with hearts while the interior of the lid reveals "Love grows stronger throughout the years". The felt-lined interior provides the perfect compartment for personal treasures. Made in the USA. Wood details: Each box is constructed of all-natural hand-polished cherry and bubinga hardwoods. Stains are not used. Cherry: Natural cherry wood is native to Eastern North America and is a light color when new. Cherry will naturally darken with age to a rosy-brown tint. Bubinga: a durable exotic hardwood native to Africa, not considered an endangered species. It has a warm, lustrous red-brown tone. The deep sapphire interior creates a luxurious space for the care and keeping of jewelry in this Prairie II Jewelry Box. Precise mitered corners and hidden "wooden keys" secure this box's long-lasting durability while the single-piece construction technique allows for perfect wood grain and color matching. The elegant box is complimented by the tone-on-tone combination of a rich Bubinga hardwood box and the swirling Kewazingo top. Inside, the drawer inserts and dividers are removable for your jewelry collection. 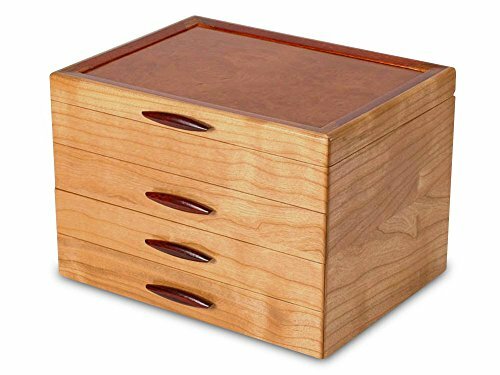 Finally, drawer stops, felt feet, and the artist's signature on the bottom finish off this exquisite piece of art and craftsmanship. This box measures 12 inches x 9 inches x 8 1/2 inches. 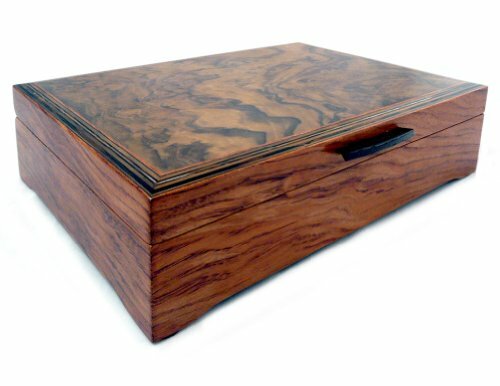 Made with care and skill from American Cherry hardwood, this box features a soft, black lining to protect its contents and the music box. It is the perfect size for keeping tiny items such as buttons, paperclips, or larger items like watches and other jewelry. It features music box in the top left hand corner. Measures three inches by four inches .